Limerick Animal Welfare is a charity that cares for abandoned and neglected animals. They campaign through education for the humane treatment of all animals. Their website tells the plight of many of their charges, particularly the poor way in which greyhounds are treated in Ireland. There is material there that will break your heart. They raise funds through donations and a charity shop they run in Limerick City. This is near the railway station at 59 Parnell Street (for those who wish to visit). A portion of their costs is recovered through rehoming animals they have saved. 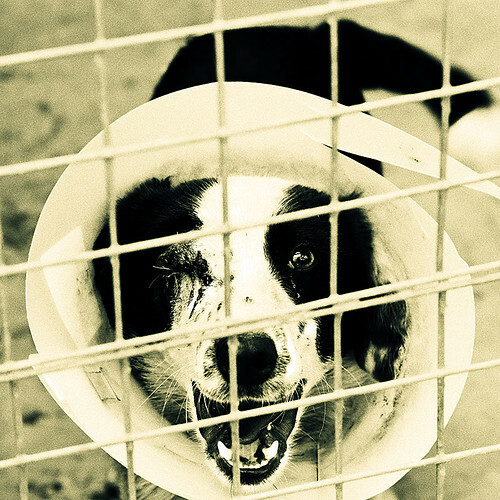 Their policy is to spay or neuter dogs and cats before moving any animal to its new home. 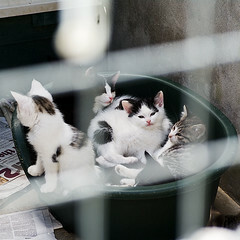 The photo above illustrates the fact that kittens are abandoned at an enormous rate. When we visited, the shelter had sixty, many waiting to be old enough to find a new home. This is Crocket, one poor animal who lost his eye due to neglect. See my Flickr set for more photos from their facilities.